THE proofs are manifest and housed throughout these pages, still yet, to build a case it is efficacious to delineate matters. Thus, the following – from 2012 to date – should be deemed as samplings. In fact, an attempt to cite all of the evidence would take so long, to wit, it would make more sense to write a book. No kidding. Nevertheless, readers can draw their own conclusions, as to whether or not this site has been on (or off) target. It’s your call. While Islamic infiltration/penetration certainly didn’t start under Barack HUSSEIN Obama, it most definitely accelerated at warp speed under his “watchful” eyes. The mountain of evidence is overwhelming…. ALAS, a “mystery” crept into the mix and required answers. 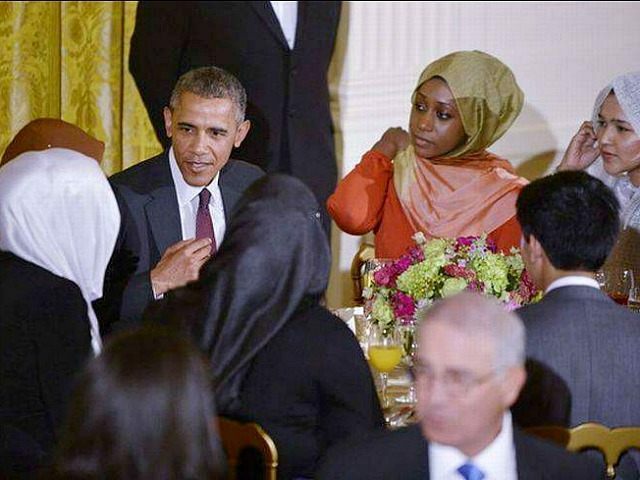 The question became: Is the POTUS an Islamic devotee? Well, his wedding ring tells the tale! “Mystery” – solved! MOVING right along…coincidentally, Benghazigate is back in plain view with Hill’s feet to the fire, so consider some of the droppings within “Benghazigate’s criminal cover up: Hiding witnesses, changing identities, and repeatedly polygraphing CIA survivors” as prima facie evidence to the charge that Libya was blown up F/B/O of the Brotherhood Mafia! The above explosion is in conjunction with the real reason for the overthrow of Qadaffi; to facilitate the largest weapons smuggling operation in U.S. history, albeit without the advice and consent of Congress. Yes, even CNN is confirming said gun running conclusions…nice of them to jump on board! In fact, Syria’s Brotherhood Mafia was the immediate intended beneficiary, but not the only one. After all, there are many Brothers to take care of. This was reported herein back in November 2012 (and fully explained within the attached links), a full 9 months ago, and 2 months after the regime’s mouthpieces started weaving their (video) tales. Mind you, for being an ‘obedient spinner’, Susan Rice was amply rewarded, as the Liar-in-Chief’s National Security Adviser! Does it get any more twisted? It is as if Al Capone is running the free world and handing out rewards to his enforcers, not unlike in the Sicilian Mafia via the capo di tutti capi, the “boss of all bosses”. Pinkie swears…. AS always, surrogates…hench people…should be considered ones mirror image, thus: “AG Holder supplanted US law by silencing criticism of Islam and more.” Now, why would he do this?? So, in light of all the above, how dangerous, treacherous and otherwise dastardly is it for America’s AG to dictate the following omerta, and over a period of several years? No more instruction about jihad, and Islam is to be considered a race. I did so in an even-handed and comprehensive manner, exploring the issue across place (Europe to East Asia), time (ancient Assyria to al-Qaeda), and ideology (religious: pagan, Jewish, Christian, Hindu, and Muslim; and political: right-wing, left-wing, anarchist, environmentalist, etc.). Only 14 of the 44 PowerPoint screens in my presentation dealt with Islamic terrorism, although several of those actually mitigated against the concept…. RESULTANT, the Muslim Brotherhood Mafia, as Sunni Islam’s spearhead, triumphed via Barack HUSSEIN Obama! You betcha. Millions of Americans have asked themselves if President Obama is Muslim. I have always said in accordance with Shariah law, Obama was born Muslim because his father was a Muslim. Did he leave Islam in later years. Doubtful, but only he knows. Obama’s father was Sunni and Obama was educated in his early years in the ideology of Sunni Islam. During the last couple of weeks people around the world have asked why Obama has not stepped in to assist the recognized government of Iraq. The Islamic State of Iraq is currently governed by Shiite Muslims. Although American media outlets will not discuss or even suggest Obama is a Sunni Muslim, in the interest of our national security it has to be considered. The manner in which Obama governs our country is more aligned with Shariah law than it is the U.S. Constitution. I do not believe there are many Americans who do not believe our beautiful country is on the verge of collapse. The past 6 plus years of Obama’s rule has been the cause of our dangerous decline. Obama is a very intelligent man and he knows exactly what he is doing. He does not like America and wants it destroyed. His domestic and foreign policies are deliberate actions for him to achieve the goal of an America gone astray. I believe most President’s would have stepped in immediately when the terrorist group ISIS (Al Qaeda) began to take over Iraqi cities. Obama could not do this because his allegiance is toward the Sunni’s…..
TO connect the Jihadi-in-Chief to ISIS one must resurrect the roots of his Mid East wildfires. Upheavals. Alas, from the moment that he PLANNED the ouster of Egypt’s Mubarak all hell broke loose, as intended. Say what? WELL, as a result of his “meddling” and his championing of the Brotherhood Mafia, Egypt’s leaders filed an indictment against Barack HUSSEIN Obama and Hill too. Interesting. Congress has yet to do the same. Orwellian. WHILE all the above cements HUSSEIN Obama to the Brotherhood Mafia, is it any wonder that the FBI, another captured surrogate, is monitoring patriots and reporting to its mouthpiece, CAIR? ALAS, it is hardly inconsequential that this investigative journalist verified the same; commentary after commentary (as noted, book-worthy) and interview after interview. IPSO FACTO, is there ANY doubt that HUSSEIN Obama isn’t a jacked-up Muslim Brotherhood terrorist, and in collusion to destroy America and Israel? Similarly, is there ANY doubt that ISIS, the spawn of the Brotherhood Mafia, hasn’t been a beneficiary of the above nexus? Consequentially and concomitantly, since the aforementioned seek the absolute destruction of America (the west) and Israel, shouldn’t HUSSEIN Obama’s name be front and center alongside ISIS’s latest threat to destroy Israel? 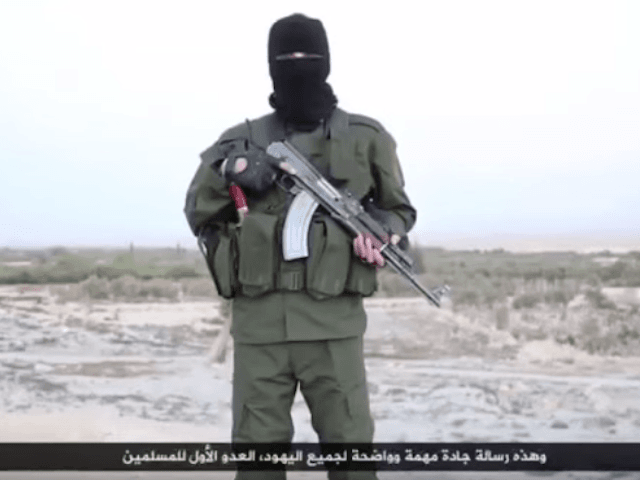 The Islamic State has declared war on the Jewish people, a man from the jihadi group declared in fluent Hebrew, in a new video released by the terrorist organization. “This is a message to all the Jews, who are the Muslims’ number one enemy,” the maskedjihadi says, wearing combat fatigues and holding an automatic weapon. “The real war has not begun and everything you have experienced so far has been child’s play — nothing compared to what will happen to you soon enough, inshallah [God willing],” he added, according to a translation by the Times of Israel. 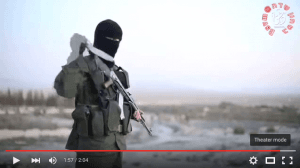 The video continues, displaying a map that shows 2 ISIS flags and outlines of its soldiers surrounding Israel’s borders. “The borders of Sykes-Picot will not protect you, and like we blurred the borders between Syria and Iraq, we will do so between Syria and Jordan and then Syria and Palestine,” he says, referring to the early 20th century agreement following the collapse of the Ottoman Empire. “We will advance towards you from everywhere, from the north and the south, from Sinai, from everywhere. We see your crimes every day and we will settle scores,” the terrorist announces. The video concludes with the Muslim holy warrior pulling a knife out of his vest and citing Koranic scripture, before finally promising that Muslims will be victorious over the Jews. CASE CLOSED: Indictment sealed against HUSSEIN Obama and his Brotherhood Mafia!! This entry was posted in Uncategorized and tagged AG Holder supplanted US law for Shariah Law, Benghazigate's criminal cover up F/B/O Brotherhood Mafia, DC WATCHDOG, Dhimmitude stealthily knocking down America's door, Islam Exposed, Joe For America, Muslim Brotherhood is already in Obama’s White House, Muslim Brotherhood Mafia: Islam's spearhead, Obama is a Muslim terrorist with Brotherhood ties to take down the USA, POTUS an Islamic devotee, Tea Party Tribune, The Homeland Security Network by Adina Kutnicki. Bookmark the permalink.